Does this patient above look a bit familiar ? You may not have seen exactly him, but you’ve passed thousands just like him on the way to work, in the elevator, in the grocery store, and so on. What is it that makes him so familiar ? The answer is simple: the buzz cut on the top of his head. Dr. Haber hair transplant patient. This patient of Dr. Robert Haber of Ohio found himself at a crossroad. A place where many men find themselves everyday: He has great hair on the sides and back of the head, but just patches of good and dying hair on the top. Does he grow the hair long and “comb over” to cover the bald parts, or does he cut it really short to make what’s left of his hair look neat and balanced ? 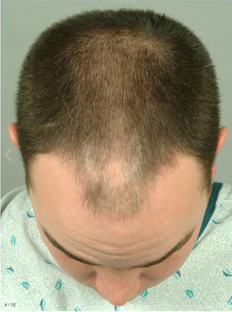 This patient chose the latter, and it obviously worked well for him until the bald patches, especially the one in the center just behind the hairline, opened up. He needed to do more than experiment with hair styles. He sought out a surgical hair restoration expert. Before and After hair transplant. Dr. Haber. mind was “excellent donor area”. And so it was. Without hair to take from the sides and back there would be nothing to work with to rebuild the hairline and the top. Fortunately, this patient had plenty and Dr. Haber could think of a dozen ways to use it to great effect. After transplanting literally thousands of hairs this young man had to wait months to see the final results. Viewing the photos it doesn’t take much to see that the waiting was well worth it. Look at how perfectly the face is now framed. Could Dr. Haber have lowered the hairline ? Not really. 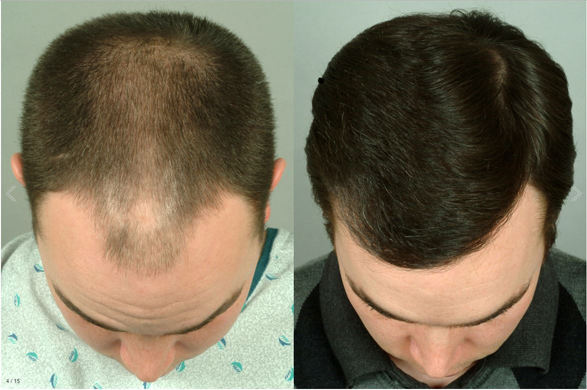 By keeping the hairline conservative Dr. Haber kept future options open for his patient. 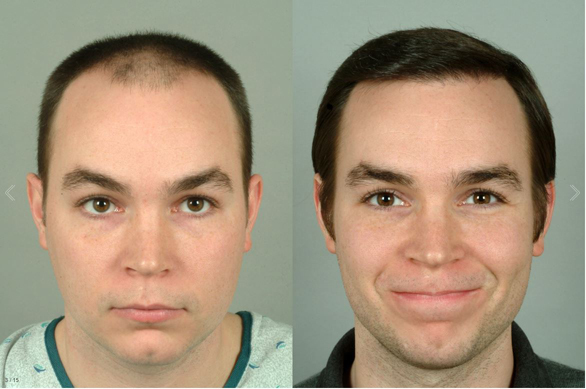 This is what a responsible and forward looking hair transplant doctor does. Look at the top-view photo to the right. Notice how natural the hair flows and how that central hole in the front just behind the hairline is now completely gone. By using hair transplants and styling this man hardly looks like he ever had any hair loss at all. This is as it should be, and while such results are commonplace for a skilled and experienced hair transplant surgeon like Dr. Haber, it is not at all the average for MOST hair transplant clinics worldwide. So what to do? Dr. Haber provided the answer. Implant a few thousand grafts densely and allow the hairs that will grow from them to combine with the existing hair. The transformation can be astounding. So be careful and do your research. Make sure the hair transplant doctor you are considering has as many impressive before and after results as Dr. Haber does. If not, go somewhere else. You deserve the best. You only get one scalp, use it wisely.